About Size: Please see the size description on the top. About Globalsupplier Store: We devote ourselves to provide high quality product and service for our dear customers. We always do our best to sell goods with fine workmanship and excellent materials. Material: Flower: Feather+mesh, headband: ribbon, clip: stainless steel. High quality materials make facinator hats much more elegant, charming and fancy. Color: White as photo show. What you get: 1pc fascinator hat with 1pc headband & 1pc clip in the package. Size: Flower dimater: about 25cm/9.8", As well as headband and clip, one size fits all women and girls. Design: Beautiful mesh flowers with feather decoration. Underneath the flower, it can be attached to a clip or a headband. 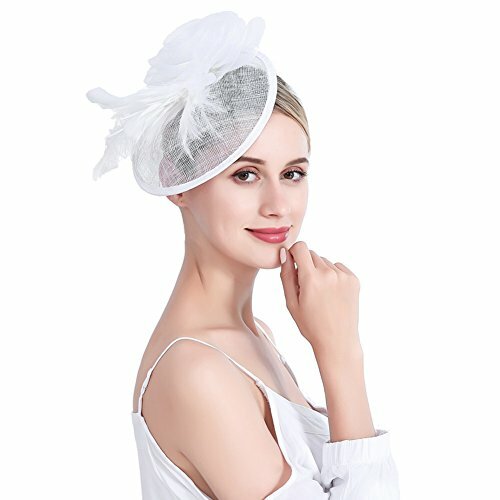 This fascinator hat is suitable for ladies to wear as church hats, derby hats, wedding hair accessory. Timeless, classic and retrol style will never be out of fashion. Occasion: Suitable for you to wear in many occasions, such as a British themed Tea Party, Kentucky Derby Race, Easter and Church, 20s Party, Cocktail Party, Flapper Events and so on. Or as great gifts to your friends.